Trend Signal Trading System is an trend following trading system based on the MTF 4TF Has indicator and Double CCI indicator. Currency pair: EUR/CHF, EUR/GBP, EUR/JPY, EUR/USD, GBP/CAD, GBP/JPY, GBP/USD, NZD/USD, USD/CAD, USD/CHF . Only take trades when Heken Ashi Smoothed , Double CCI, Daily HAS and Gann Signal trend are agree (green color). Only take trades when Heken Ashi Smoothed , Double CCI, Daily HAS and Gann Signal trend are agree (red color). Initial Stop loss on the previous swing after 20 pips in gain move stop loss at the entry point. Profit Target predetermined ( recommended option). In the picture below Trend Signal Trading System in action. Tested it and this is a very good system! 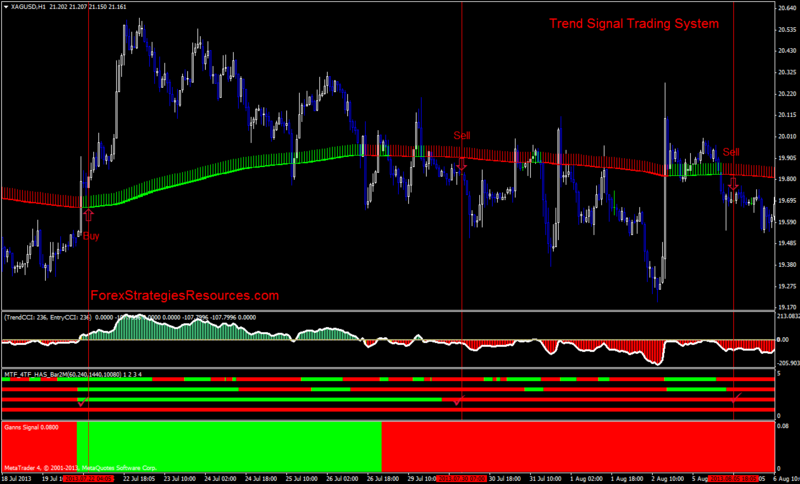 Signals dont come often but when they come they are 100% accurate!